Read about this tragic fatality involving a pipe wrench. The toes of the left foot of the drill rig assistant were amputated by the rotation head of a diamond core drilling machine as it travelled down the feed frame. The drill rig assistant ascended the mast in order to align a fishing tool with the rotation head, he pushed the tool into alignment and the Driller lowered the head to engage the fishing tool. The left boot of the drill rig assistant was placed on the feed frame of the drill and as the rotation head travelled down the feed frame it sliced through the boot amputating the toes of the drill rig assistant. 1. The fishing job was caused when an HQ quillrod failed. The picture below is a photograph of the failed pin of the quillrod which clearly shows that the pin failed through fatigue, note the rust in the root of the failure. 2. There was no quillrod management program in place and site staff indicated that they could not remember when last the quillrod was changed. 3. Proper fishing tools were not available on site, the Supervisor made up a swedge by welding pieces of steel to an NQ drillrod which was in turn welded onto a piece of HQ drill rod. This resulted in a “fishing tool” that was almost 4.5 meters long. 4. The “fishing tool was dropped into the fish but because of its irregular shape it did not sit vertically. The injured man ascended the mast in order to push the homemade fishing tool into vertical alignment. 5. In doing so he climbed up the “wrong” side of the mast, ie. the side without a ladder, he therefore had to stand on one of the cross-members of the feed frame for support. 6. The injured person did not wear a fall arrest device. It is clear that the injured man did not possess the necessary skills, knowledge or experience to allow him to safely work on an active drill site. It is essential that all operational staff are trained, assessed and found competent before being allowed to work on a drill site. Appropriate fishing tools must be kept on site or must be readily available from a nearby site. 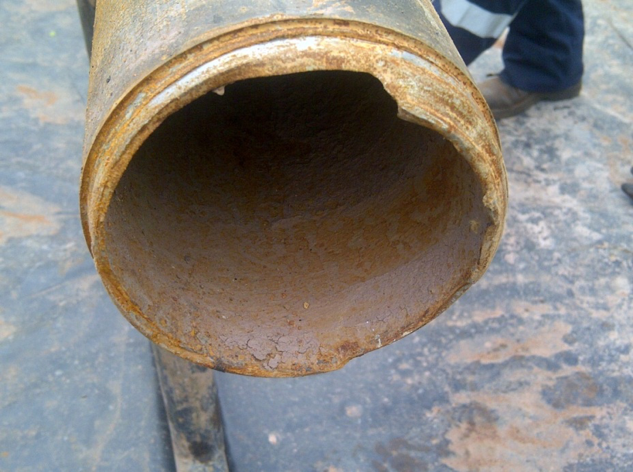 A Driller was fatally injured on a drill site in the Rustenburg area when he was struck on the head by a drill rod that had failed whilst drilling. While commissioning a top-drive exploration drill, a joint on a B size wireline drill rod failed which resulted in the top-most drill rod striking the drill rig assistant on the head. The driller had previously pulled the inner-tube due to a core blockage but elected to add a new 3-meter rod below the drill head rather than drill the short remaining portion of the previous corebarrel. This resulted in a joint in the “quill” section high above the rod clamp. It is suspected that the fast feed lever was activated instead of the fine feed lever while rotating which placed a very large down-thrust on the quillrod. This very significant downthrust caused the quillrod to bend and deform to such an extent that the exposed connection failed. The severely deformed drill rod then struck the assistant on the back of his head causing a fatal injury. Although full details of the accident are not yet available it seems likely that several factors caused this tragic accident. At the time of the accident, the deceased was standing on the Driller’s platform behind the chair in which a trainee driller was sitting, the deceased was instructing the trainee on the operation of the drill rig. It seems likely that the trainee activated the incorrect control lever due to a lack of familiarity with the control panel. 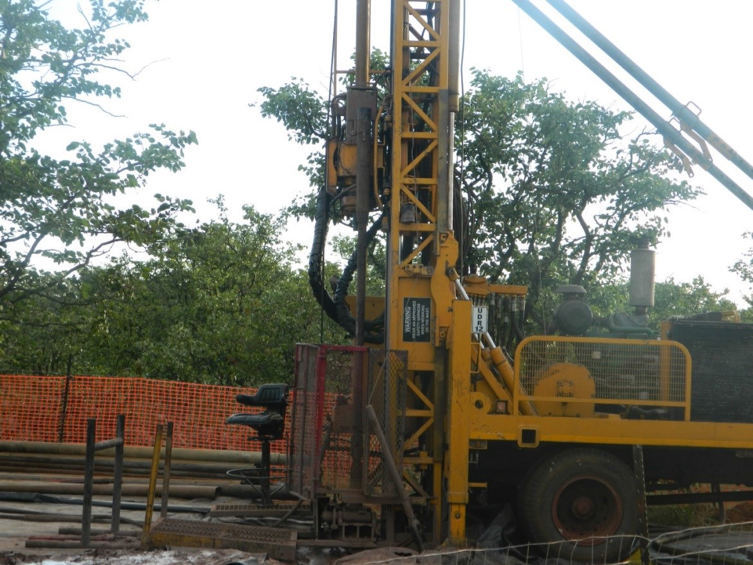 The Driller elected to add a new 3-meter drill rod instead of completing the previously incomplete core run. This meant that there was an exposed drill rod connection approximately 1,2 meters above the rod clamp. When the very large downthrust was applied, the quillrod bent at the connection and then failed. Although it is possible that the drill rod connection suffered a normal fatigue failure due to cyclic loading, it is highly unlikely given the significant deformation in both the upper and the lower drill rods. It is essential that every lever, gauge, and control knob on a drill rig is clearly labelled, either in a language understood by the Driller or with a symbol. It is essential also to remember that every joint in the drillstring is subject to cyclic loading and is therefore a potential point of failure. If the failure takes place below ground level then it is unlikely that the failure will result in an injury. Failure of any joint above ground level is potentially dangerous and the chances of a serious injury resulting are very great indeed. All drilling contractors and Safety Officers should ensure that procedures are in place to ensure that exposed joints between the rotation head and the rod clamp are no more than 500 mm above the rod clamp. Drillers must be made aware of the extreme hazard that this situation presents. Procedures should also be in place to ensure that quillrods are inspected on a daily basis to check for any signs of abnormal wear, notching due to the chuck slipping or any other sign of potential failure. 1. Reduce the number of threaded connections in the quillrod – if possible use a 6 meter drill rod in preference to 2 x 3 meter drill rods. a. Only new drill rods should be used to make up a quillrod and a protocol to replace the quillrod at regular intervals should be introduced. b. Threaded connections should be correctly pre-torqued as per the drill rod manufacturers’ specifications. c. A saver sub should be used on the bottom-most connection to protect the pin thread on the bottom-most quillrod. d. Avoid slipping of chuck jaws and if circumferential grooves are noticed in the quill rod then it should be changed out with a new quill rod made up of brand new drill rods. 3. If available, use a heavy-duty wireline drill rod in preference to standard wireline drill rod.